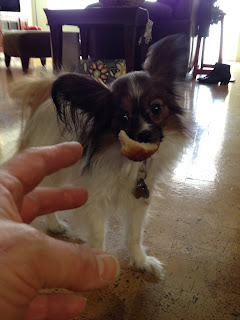 Appliance Repair & Our Pet Family Friends- Happy Papillon! One of the most enjoyable things about going into people's homes to repair appliances is having the opportunity to meet their wonderful pets! Here at A-Appliance Repair Service, we truly love animals, and it's a privilege to be able to meet and get to know so many of our customers' pet families. Of course, it does help that our Chief Technician is practically Dr. Doolittle, but we'll let you draw your own conclusions about that. Recently, our Chief Tech had to make a call at a customer's home to repair their dishwasher. 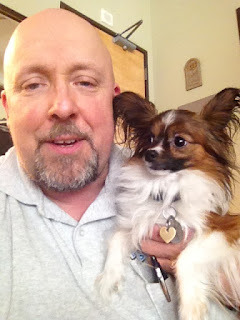 The customer was not going to be home at the time and "warned" us that her vivacious Papillon would be there to meet and greet us, to which we responded, "No problem!" Sure enough, "Happy Papi" was waiting at the door, and well, you can see from these photos what happened. This dishwasher repair happened to involve several visits. 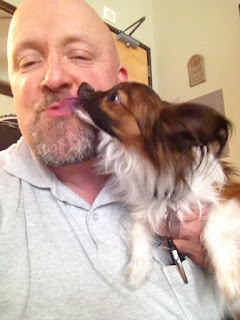 When we shared our experience with the customer about all the fun our Chief Tech had with "Happy Papi" during the repair visit, the customer assured us that she felt entirely comfortable with us being in her home with her Papillon even when she could not be there. What followed was not only a very successful dishwasher repair, but a new, wonderful friendship blooming between Happy Papi and our Chief Tech, which he considers to be "the icing on the cake" part of the appliance repair business! So if you have a dishwasher, stovetop/oven, washer, dryer or refrigerator in need of repair and you have pets in your home, please don't hesitate to call us. It's our pleasure to visit with our Pet Family Friends whenever we get the chance!